MedCamps of Arkansas hosts camps for children with special medical conditions, so they can have the summer camp experience that every kid deserves. Children with special medical conditions, such as muscular dystrophy, spina bifida, and diabetes, can go to camps catered to their individual needs. There’s even a sibling camp that lets children with specific medical requirements attend camp with their siblings! Rainwater, Holt & Sexton attorney Vincent France is proud to have his sister and father serve on the board of this incredible organization. 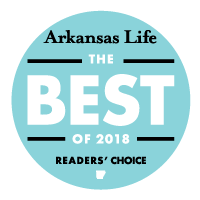 Visit the MedCamps of Arkansas website to find out more about how they provide safe, medically appropriate camps for special needs children. RHS supports the Cystic Fibrosis Foundation Arkansas Chapter! The Rainwater, Holt & Sexton staff would like to thank Melody Sugg for taking time to talk to us about cystic fibrosis and what the Cystic Fibrosis Foundation does for patients here in Arkansas. Be sure to get your tickets now for the Little Rock Taste of the Finest event—we’ve got ours! Attorney Matt Hutsell will be an honoree at this year’s event on Aug. 20 at the Metroplex Event Center in Little Rock. Find out more here. John Rainwater, an attorney at Rainwater, Holt & Sexton, recently had a great day presenting “Level Playing Field” to two of Ms. Sonja Williams’ Rights and Liberties classes at Hall High School. As a member of the Young Lawyers Section of the Arkansas Bar Association, John is often involved in community and educational outreach. Monthly Charity Giveaway Winner – Autism Speaks! The staff at Rainwater, Holt & Sexton would like to thank Arkansas Walk Now for Autism Speaks chair, Dawn Itzkowitz, for stopping by to tell us about all the wonderful work the organization does for those with autism in our community! Autism Speaks works directly with doctors to find best practices and techniques for autistic patients. Show your support by participating in their Walk Now for Autism on October 3. May 1, 2015 -Our dedicated case manager, Christina, attended the ALS Association Caregivers Conference on April 25, an event that connects ALS patients with service providers that can help them. Christina handed out packets on living wills and scheduled times for ALS patients and their families to complete the wills with an attorney at our office. This is just one way Rainwater, Holt & Sexton strives to give back to the community. Thank you, Christina! During her more than 30 years of practicing employment law, Arkansas Bar Association President-Elect Designee and Rainwater, Holt & Sexton attorney, Denise Reid Hoggard, has seen the state’s gender pay gap budged by just 10 percent. She explains that proving discrimination under the Arkansas Equal Pay Act falls on the employee. And in an at-will employment state—such as Arkansas—employees can be terminated for breaking even insignificant rules. While progress is being made to close the pay gap, Denise urges government leaders to step up and help. Click here to watch a video of Denise discussing the state’s Equal Pay Act with Little Rock’s KATV News. RHS supports The Leukemia & Lymphoma Society Arkansas Chapter! We voted you our charity for March! Thanks to Kim DuPas for stopping by and talking about all the wonderful services your organization provides for our community. Not only do they provide financial support for the patients and families living with these diseases, they also provide support groups and education. When faced with the diagnosis of these diseases, many families don’t know where to turn or what to do. According to the Johns Hopkins School of Medicine, there are currently more than 30,000 Americans who have been diagnosed with the condition known as amyotrophic lateral sclerosis (ALS)—or Lou Gehrig’s disease. To help raise awareness about this devastating disease, the Little Rock personal injury lawyers at Rainwater, Holt & Sexton are sponsoring the Arkansas Chapter of The ALS Association’s Walk to Defeat ALS 2015. ALS is a degenerative neurological condition that slowly causes people to lose mobility in their bodies. There is no known cure for the disease, and treatment options are considered limited. The team at Rainwater, Holt & Sexton became passionate about raising awareness about ALS after one of the firm’s founding partners, Stephen Holt, was diagnosed with the condition. Now, the firm is hoping to raise as much as $125,000 during the upcoming Walk to Defeat ALS so that the funds can be used to provide treatment options to someone suffering from the disease. If you wish to participate in the walk, an article from Arkansas Online says the event will take place at 10 a.m. on Saturday, April 11, at the Clinton Presidential Center. If you are unable to make it to the event, you may also donate to our cause. We are hopeful to see you at the upcoming event and encourage you to stay up to date on our latest philanthropic events by regularly visiting our community page. We enjoyed meeting the passionate ALS advocates in our community at the ALS Corporate Breakfast hosted by Rainwater, Holt & Sexton on March 12. Our firm wants to send a special thank you to the ALS Association Arkansas Chapter for hosting Mike Rainwater and Bob Sexton as speakers at the event. Sharing Stephen Holt’s story is important to all of us. We can’t wait for the Walk to Defeat ALS on April 11, 2015. Visit the event page to find out more or join a team today. Rainwater, Holt & Sexton helps sponsor the Pine Forest Elementary archery team, which recently won the elementary division of the regional tournament held at Robinson High School. The team will now be able to take their top 12 archers to the state tournament in Hot Springs at the end of March. Ella Fu, daughter of Rainwater, Holt & Sexton attorney JaNan Davis, ranked among the top four female archers, and she will be competing at the state tournament! We are proud of these little ones for learning a skill as unique as archery, and we’re excited that they’re having fun doing it. Mike Rainwater and Bob Sexton are honored to be co-chairing the 6th Annual Central Arkansas ALS Walk on April 11, and our employees are excited to participate in the walk for the second year. Click here to find out more about the ALS walk taking place at the Clinton Presidential Center. The Walk to Defeat ALS is an opportunity to bring hope and support to people living with ALS and to raise money to one day find a cure. ALS is one of RHS’s biggest causes, and it’s one we support with passion and enthusiasm. Rainwater, Holt & Sexton sponsored a free estate planning clinic hosted by the Leadership Academy Alumni Section of the Arkansas Bar Association on Saturday, Feb. 21. Despite unfavorable weather conditions, cancer patients and their families came to the clinic and received free estate planning documents prepared by a volunteer team of lawyers, paralegals, notaries, and witnesses. Our firm would like to thank Christina Alexander, Terri Singleton, Steele Alexander, Lauren Manatt, Vincent France, and John Rainwater for volunteering their time on a Saturday to help those in our community affected by cancer. The Leadership Academy Alumni Section of the Arkansas Bar Association is hosting a free estate planning clinic for cancer patients and survivors on Saturday, Feb. 21. During the event, lawyers will available to assist cancer patients and survivors in preparing wills, powers of attorney, and living wills. John Rainwater, of Rainwater, Holt & Sexton, is co-chairing the pro bono project at UAMS Cancer Institute. Two other attorneys from the firm, Lauren Manatt and Vincent France, will also be volunteering at the event. Appointments are available at 10:30 a.m. and 11:30 a.m. on Saturday, Feb. 21. This is a free service, but advance reservations are required. Call (501) 868-2985 to reserve your spot now. For more information, check out the UAMS Winthrop Rockefeller Cancer Institute website. Helping people in our community is important to the Little Rock personal injury lawyers at Rainwater, Holt & Sexton. That’s why we’re proud to be supporting an organization that provides assistance to young people in Arkansas. The E3 Club After School Program is provided by the Salvation Army. It’s open to participants age 10-17 who live in the Baring Cross neighborhood of North Little Rock, from 3:30-6 p.m. on Mon.-Thurs.. The program provides children with an opportunity to grow and nourish their relationships with Christ. The E3 Club is always in need of supplies for both children’s projects and administrative purposes, including paper, pencils, pens, notebooks, and binders. To help purchase some of these items and to assist with other costs, our team of Little Rock personal injury lawyers recently collected more than $670 for the program. We are proud to be able to contribute to this wonderful program and encourage you to do the same. If you would like to donate items or your personal time to the E3 Club After School program, feel free to contact Marquita Rogers at (501) 416-0678. You can stay current on our other service projects in Arkansas by checking the Community News page on our site. We are passionate about anti-bullying efforts here at Rainwater, Holt & Sexton. That is why we sponsored Little Rock Christian Academy’s talk by “The Protectors,” a faith-based organization helping to reduce bullying in communities across the nation. This program is geared toward educating parents, teachers, and authority figures on the signs and ways to prevent bullying.